Have you heard of “Summer Slide”? Apparently, it affects our children at the rate of losing two months of math and reading skills during the summer. “Summer Learning Loss” another term that is common now and means the same thing. These are expressions that I don’t remember hearing when I was a kid. Most parents fall on one of two sides of the coin with this issue. On one hand, it seems like summers keep getting shorter and shorter. We just want our kids to be kids while they can. Summer is their break and just like we don’t want to work during our time off, they shouldn’t have to either. A large majority of us fight with our kids to do homework every night during the school year. Summer is our break too. On the other hand, the statistics are convincing. Perhaps there simply wasn’t much data when we were kids but now that there is, maybe we should do something about it. It’s not to say our kids need to literally be in summer school for eight hours a day but reading each day isn’t asking too much. Our kids still manage to complain about being bored anyway. I fall somewhere in between the two camps. They are just kids. A well-planned vacation can be a great teacher. But also, let’s read a book to calm down at night, even during the summer. I’ve tried various incentives over the summer years to encourage my kids to read and work on their math during the summer. I have never been successful and what usually happens is we fight over it. What has worked the best for me is Summer BINGO. I create a simple BINGO sheet, like the one below. Then I fill it out differently for each child depending on what I think is reasonable. When the kids come home at the end of the school year with all of their school workbooks they didn’t quite get through – such as their math workbook, handwriting, etc., I don’t throw them away. I save those for the summer and incorporate them into the BINGO squares. The sample document can be downloaded here from the resource library and can be customized for your children. I have it worked out so Reading, Math, Handwriting, Typing, and a memorized Bible Verse (I try to sneak in bible verses wherever possible!) all show up once per BINGO. I also removed the FREE space and made it an additional Reading square. Just type over these and customize it for you. You do not care if they win a BINGO or not. This means no fighting or nagging from you. The incentives do all the work for you. The coupons for winning a BINGO are implemented so well your kids will want to win on their own. It is not about what is written on the coupon but how it is implemented. I print out the coupons like the ones below for the prizes (get yours from the resource library). 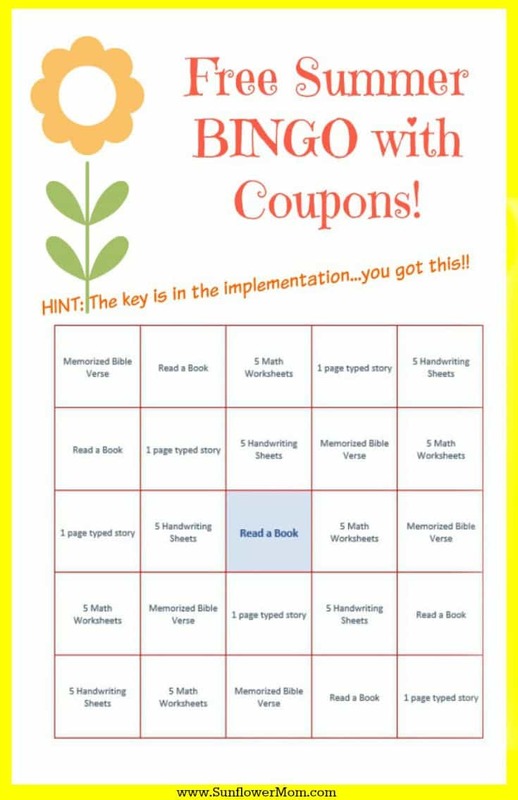 I let the kids know beforehand what the coupons are and they can pick their own after they get a BINGO. Instead of coupons, you could have actual prizes bought already – this might work better for younger children. Or have pictures of the toys as the coupons. 1) The coupons can be cashed in immediately. This means if I give my son a Sonic coupon and he doesn’t like dinner, then I do quick Sonic run. Sound like a pain? Is it worth it that your child completed 5 squares of reading or math on the BINGO sheet in return for one run through the Sonic drive-through? If the coupon is to go swimming, for example, then we plan the date immediately for the next upcoming weekend instead. 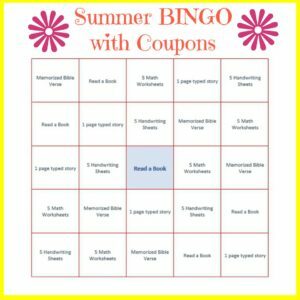 2) The coupons are something they will not get this summer any other way except through winning this BINGO. Make sure when you are filling them out that the activities are unique or not something you would normally do. If it is, then make sure it is something your child would want multiple times. In my example earlier about my son and Sonic – he would be ecstatic if he received 5 Sonic coupons. 3) The coupons (or prizes) aren’t really putting you out – meaning you would probably do these things over the course of the summer anyway but now they are “special” because you are only doing them once and if your child earns it, you are accountable for doing it – it’s only fair. 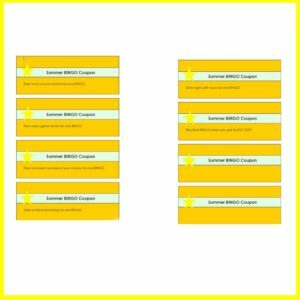 The coupons can be customized as well. There are some pre-filled ideas and some blank ones in the resource library for free. I have a coupon for a Blackout BINGO as well. Yes, this means when they get the last BINGO they get 2 coupons at once: a regular BINGO and a blackout BINGO. I think that’s awesome, but you can leave this out if you wish. This concept works well for any incentive. You don’t have to use it solely for summer academics (you can remove the “Summer” in the header section of the Word document.) I like to keep the coupons fairly special. I give them as a present a couple times a year for holidays and then they can earn them during the summer but that’s it. It keeps the coupons super fun. Make it all about books: Read a Graphic Novel, Read a Fairy Tale, Read a Non-Fiction Book, Read a Memoir, etc. Make it Outdoors Related: Go on a nature hike, Bike Ride, Play Basketball for 30 min, Take the Dog for a Walk, etc. Chores related: Do the dishes, Take out the trash, Clean your room, Clean the bathtub, Clean out the Pantry, etc.